Farm Biz class of 2019: Hayley Wingerd, Patrick Kersten, Lynn Archer, Kim Overaa, Mike Ingram, Adam Pearcy and Jason Rainey. New farms are springing up in our community! From oyster mushrooms to hops, new farmers are finding niche crops that local markets are craving. 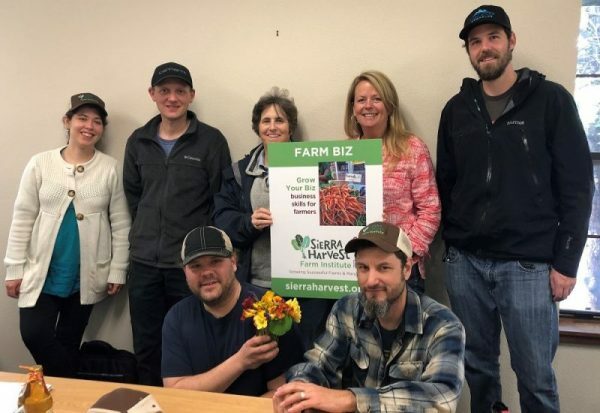 The members of the Farm Biz class of 2019 highlight the great land-based entrepreneurs working hard to create a vibrant food system in Nevada County. Learn more about a few of these new farm businesses and the wonderful products they are supplying our community. You’ve never seen Oyster mushrooms like the ones Lynn Archer grows at Sierra Gourmet Mushrooms. They look like they’re made of velvet and a single cluster is the size of a dinner plate! If you were at Soup Night, you may have stopped by her table to ogle her amazing display of mushrooms and asked, like many did, “are these real? !” Oh yes, they are real, and they are available at many local grocery stores and restaurants. Would you like to have a box of locally grown, fresh veggies delivered to a location of your choice every week? Look no further than, King of the Woods Farm located just minutes from downtown Grass Valley. Farm Biz grad Hayley Wingerd and partner Evan, co-owners of King of the Woods, grow vegetables and mushrooms on their innovative, micro-farm. Don’t just eat local, drink local! Mike Ingram of Yuba River Organics in Penn Valley is growing hops on a big scale. He plans to plant a few acres of the varieties most sought after by local brewers. Adam Pearcy is growing high elevation vegetables at FourK Farm! Located up Highway 20 at an elevation of 4000 feet, Fourk Farm offers a CSA with multiple pick-up locations throughout town. Hats off to our Farm Biz graduates! We wish you success!